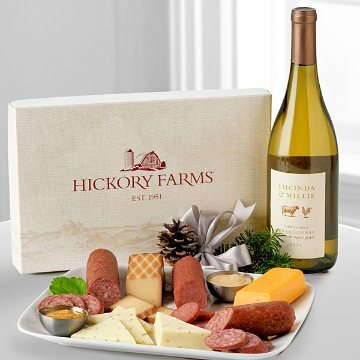 At this special time of year, what shows you care better than a gift featuring two Hickory Farms Signature Sausages, three delectable cheeses, two kinds of mustard - and the earthiness and rich fruit flavors of an organic Cabernet Sauvignon from Lucinda & Millie. This Cabernet's aromas of blackberry, cassis and cedar reveal full flavors of plum, blueberry and blackberry with licorice and spice. This gift includes the following: Hickory Farms Signature Beef Summer Sausage 5-0z, Brown Sugar & Honey Turkey Summer Sausage 5-oz, Smoke Cheddar Blend 4-oz, Farmhouse Cheddar 4-oz, Three Cheese & Onion 4-oz, Honey & Pineapple Mustard 2.5-oz,.